Partie Septentrionale des Pays Bas, Comprenant Les Etats Generaus des Provinces Unies. 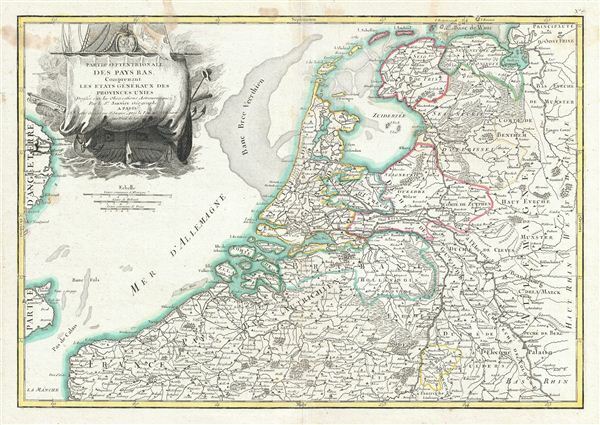 A beautiful example of Jan Janvier's 1783 decorative map of the Low Countries or Pays Bas. This region covers modern day Holland and Belgium from Friesland south to France, west to the english Channel, and east to Germany. excellent detail is offered throughout with mountains, rivers, forests, national boundaries, regional boundaries, forts, and cities identified. Some undersea detail is included. A large decorative title cartouche depicting a merchant ship appears in the upper left quadrant. Drawn by Jan Janvier around 1783 for issue as plate no. 7 in Jean Lattre's 1783 issue of the Atlas Moderne. Jean or Robert Janvier (fl. 1746 - 1776) was a Paris based cartographer active in the mid to late 18th century. Janvier true first name is a matter of debate, as it appears as it often appears as either Jean or Robert. More commonly, Janvier simply signed his maps Signor Janvier. By the late 18th century Janvier seems to have been awarded the title of "Geographe Avec Privilege du Roi" and this designations appears on many of his latter maps. Janvier worked with many of the most prominent French, English and Italian map publishers of his day, including Faden, Lattre, Bonne, Santini, Zannoni, Delamarche, and Desnos. Jean Lattre (fl. 1743 - 1793) was a Paris based bookseller, engraver, and map publisher active in the mid to late 18th century. Lattre published a large corpus of maps, globes, and atlases in conjunction with a number of other important French cartographic figures, including Janvier, Zannoni, Bonne and Delamarche. He is also known to have worked with other European cartographers such as William Faden of London and the Italian cartographer Santini. Map piracy and copyright violations were common in 18th century France. Paris court records indicate that Lattre brought charges against several other period map publishers, including fellow Frenchman Desnos and the Italian map engraver Zannoni, both of whom he accused of copying his work. Lattre's offices and bookshop were located at 20 rue St. Jaques, Paris, France. Lattre, Jean, Atlas Moderne ou Collection de Cartes sur Toutes les Parties du Globe Terrestre, c. 1783. Very good condition. Original centerfold exhibits toning. Blank on verso. Platemark visible. Some spotting near title. Rumsey 2612.021. Phillips (Atlases) 664. National Maritime Museum, 215.